Te Papa scientists Dr Susan Waugh and Dr Lara Shepherd recently completed a study of foraging movements of Westland Petrels. The birds were studied in 2 years and during 3 parts of the breeding season (pre-breeding, incubation and chick-rearing). This gave great insights into which ocean areas the birds are using, and where they concentrate their efforts. BirdLife’s Mark Miller and Susan Waugh from Te Papa deploy a GPS logger on Westland Petrel Procellaria westlandica to track its movements at sea. Photo: Clara Peron. Birds fed very close inshore along the entire west coast of the South Island of New Zealand, and also spent considerable time in Cook Strait, off Wellington’s south coast, and in the Kaikoura area. Birds were mainly feeding over the continental shelf areas, in water depths of less than 200m. Looking at some of the tracks, you could imagine you’d see the birds from the coast, on the right day. They were flying very close to shore, which is fairly rare for petrels. There were distinctive behaviours of visiting areas nearby the nesting colony near Punakaiki in Westland, where birds travelled slowly in meandering flight and spend 2 – 4 days at sea. 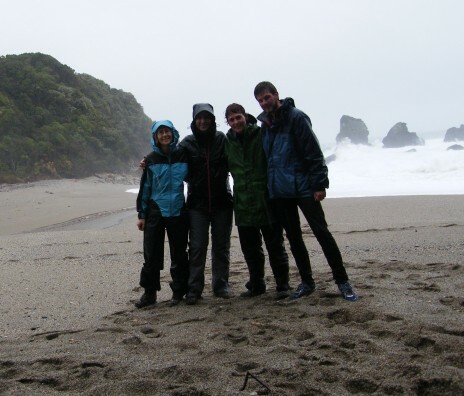 They visited BruceBay, the Karamea Bight, and areas off central Westland in the Tasman Sea during these trips. This differed from birds travelling to more distant locations such as Kaikoura or Cook Strait where the birds appeared to travel more directly, and birds that went further away spent longer at sea. One bird rather dramatically flew around the entire south island, before cruising home to visit its nest-mate. Westland Petrel which circumnativaged the South Island of New Zealand during a foraging trip in the incubation period in June 2012 Graphic: D. Filppi, Sextant Technology Ltd.
We developed a new way of examining the movements of birds, in collaboration with Dr Dominique Filippi of Sextant Technology. We plotted the bird locations for our group of tracked birds, and simultaneously showed the day or night conditions. This showed some spectacular results with birds moving quite synchronously at times, and clearly as active at night as during the day. The preliminary results for this dataset are available to see as a short movie. During early September 2012, colleagues from the CNRS France, Clara Peron, and from BirdLife International in UK, Mark Miller assisted with the field work. 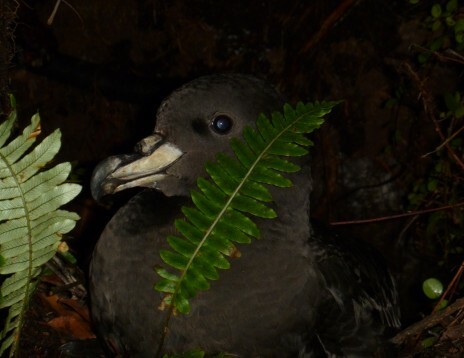 Westland petrel on the breeding colony checks out a fern. Photo: Lara Shepherd. There was rather a lot of rain, and over one weekend alone over 120 mm of rain fell! We were glad of the extra help, as we were catching birds visiting their chicks between dusk and dawn, and a fair amount of staying up in the small hours was done. Field team taking a break from the mud on our way home. From left to right: Lara Shepherd (Te Papa), Clara Peron (CNRS), Susan Waugh (Te Papa), Mark Miller (BirdLife International) Photo: Mark Miller. This study was conducted by Te Papa in collaboration with Dr John Arnould of Deakin University and Dominique Filippi of Sextant Technology Ltd. We thank Department of Conservation for their assistance with aspects of the field programme and Ngati Waewae for consent to carry out the programme. Great work very interesting to see. Hope to see some Westlands in the ‘flesh’ very soon.